No, half of American schoolchildren are not "low-income"
It might be the most common mistake in education writing and policy analysis today: declaring that a majority of public school students in the U.S. hail from “low income” families—or, even worse, that half of public school kids are “poor.” Let’s put a stake through the heart of these claims because they are simply not true—and paint a distorted picture of the challenges America’s schools are up against. The problem starts with the use of the free-and-reduced-price lunch program (FRL) as a marker of economic disadvantage. Generally, students living at 130 percent of the poverty level or below are eligible for free lunches; those at 185 percent or below can get a reduced price lunch. This was always a crude and imperfect indicator, but as Matt Chingos explained last year, for two reasons it’s now completely divorced from reality. First, Congress expanded “direct certification,” under which students are deemed FRL eligible because they receive other forms of public support, such as food stamps. Second, Congress expanded “community eligibility,” which allows schools with at least 40 percent of students identified as eligible for FRL through direct-certification-type means to provide free lunches to all of their students and eliminate paper applications going forward. These changes are undeniably good for expanding kids’ access to free school lunches. But they may mark the beginning of the end of FRL’s moonlighting for researchers and policymakers as a socioeconomic indicator. 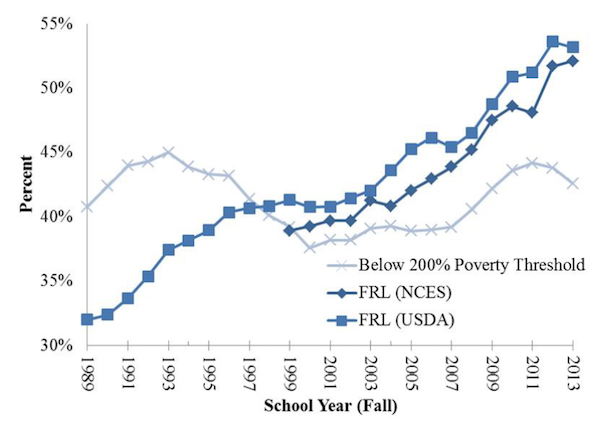 As a result, as Chingos showed in figure 1 below, in recent years the percentage of FRL students rose steadily even as the proportion of kids who are actually low-income has fallen. SOURCE: Matthew M. Chingos, “No more free lunch for education policymakers and researchers,”Brookings (June 2016). As of 2013, then, about 40 percent of American school-kids were low-income—defined as coming from families earning 200 percent or less of the poverty level. Given the strengthening economy, the number is probably closer to 35 percent by now. And 35 percent is less than fifty. That alone should keep writers and editors from printing the claim that half of American students are low-income. But there’s more to the story, and it’s especially important for folks writing about schools at the state or local level, and for policymakers, too. It’s about the vast differences in the cost of living across the United States—differences that are not accounted for in the official poverty measure or in the FRL program. It’s not hard to understand why this is a problem: A dollar goes a lot farther in some parts of the country than others. In low-cost communities FRL statistics will overinflate the percentage of students who are economically disadvantaged; in high-cost communities they will understate reality. Let’s take a look at how this plays out. The Census Bureau publishes an index that tries to capture cost-of-living differences by metro and non-metro areas nationwide. (This examines differences in housing costs, which are the major drivers of differences in cost-of-living.) The median community in the U.S. with respect to housing costs is Modesto, California, with Fort Walton Beach, Florida; Reno, Nevada; Lancaster, Pennsylvania; Madison, Wisconsin; and Houston, Texas, very close as well. The cheapest is rural Alabama, with rural Arkansas, Kentucky, Louisiana, and Tennessee in the same ballpark. In rural communities in these Southern states, housing costs a third less than the national median. The most expensive area, not surprisingly, is Silicon Valley, with San Francisco and Honolulu close behind. In those areas, housing costs are almost double the national median. These differences have a big impact on families’ standard of living. Simply put, you can live pretty well in rural Alabama on what looks to be a fairly small income because housing is so cheap. (Of course, lots of other things are cheaper, too.) And the opposite is the case in Silicon Valley and the Bay Area. Yet none of that is taken into consideration in our official poverty measures or in the FRL program. Consider Alabama. According to the National Center for Education Statistics, 58 percent of its students were FRL eligible as of 2013–14, meaning they were living at or below 185 percent of the federal poverty line. For a two-parent family with two children, that was about $44,000. But if we adjusted for cost of living differences, a family in rural Alabama would need to earn about $38,000 or less to be at or below 185 percent of poverty. A family above that amount surely isn’t rich, but they also aren’t “economically disadvantaged.” They are what we used to call middle class. All of this needs to be on the minds of reporters, analysts, and policymakers. It could be that some schools or districts or states look like they are “beating the odds”—but only because their students aren’t as needy as we’ve been led to believe. Or we might discover some schools or districts or states that deserve more credit for their student achievement results, considering their rates of true disadvantage. I would urge those writing about low-cost areas in particular to be careful about buying the argument that a huge proportion of local students are poor. The best approach might be common sense. Sure, $40,000 is low-income in San Francisco or New York City. But in rural Alabama? Probably not. This has big implications for policy too, of course. If we don’t pay attention to differences in cost of living, we may end up funding low-cost areas too generously, and high-cost areas too stingily. In fact, that’s precisely what this study by Bruce Baker and colleagues says the Title I formula is doing—sending too much money to rural states and too little to urban ones. Those are big challenges to fix. What’s easy, though, is for us writers to stop using FRL incorrectly. Now you know, so no more false claims about America’s low-income student majority!